The singer and guitarist’s forthcoming album, ‘Sunshine Rock,’ is due February 8. 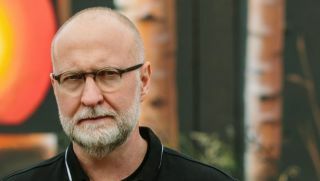 Bob Mould has announced the release of a new signature distortion pedal, Sunshine Rock, created in partnership with Tym Guitars. The new offering is named in honor of Mould’s upcoming solo album, Sunshine Rock, due February 8 via Merge Records. Sunshine Rock is being offered in a limited run of 40 pedals, with a list price of $225. The handcrafted units are similar to the stomp boxes made for Mould's previous albums Beauty & Ruin and Patch the Sky, but with new artwork to celebrate Sunshine Rock. The custom-made stainless steel enclosure has typical volume and gain controls with a yellow LED, true bypass switching, and is powered by a standard 9V adaptor jack. The pedal is available for pre-order here.